Hugs to you as you remember your Dad and the anniversary of his passing. I'm glad you began blogging. It seems many of us started around the same time. It was 10 years for me last month. 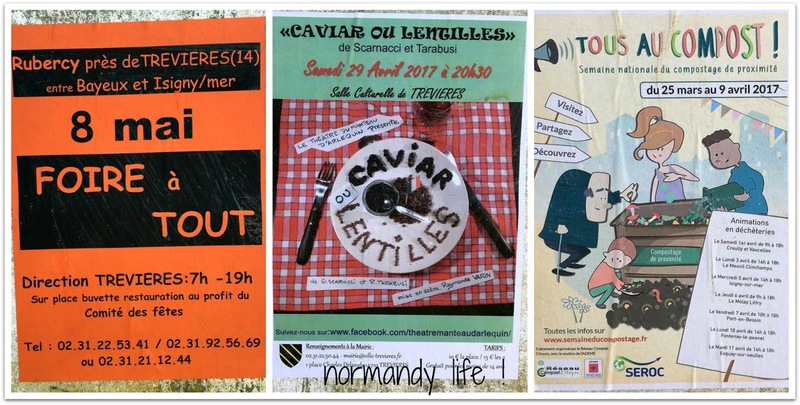 You've shown such interesting posts of what it's like to live in Normandy in your renovated presbytère and surrounding village. I've always enjoyed reading your posts. We never do know what the future holds, do we? That's both reassuring and daunting. Wonderful, everyday photos from your corner of the world. Happy new week, Maggie, and thank you for hosting MM. Maggie, it's amazing how quickly time passes. I began writing Hyacinths in 2009, with your help and encouragement. I'm glad you have continued to share your life in Normandy. It's a treat to follow along. Your photos are always stellar! Thanks for sharing and thanks for hosting Mosaic Monday. Such lovely memories - and I agree - you should write a book - with photos. I just adore that sort of book. Your photos are glorious - such a beautiful area to live in. I need to go back through your blog and read posts from the beginning. Have a grand week ahead. Thanks for sharing such good memories today. A happy/sad remembering. My parents are both gone and the memories come to my mind somewhat randomly and comfort me. Thank you for Maggie for sharing slices of your life in Normandy and for hosting your 37th Mosaic Monday. Always appreciated. Good morning Maggie. I never realised that you have lived in Normandy for so long, and blogged also so many years... Compared to many of you I am a new beginner, with my not yet two years... But blogging is really fun and widens my world. So warm thanks to you Maggie & the others! Happy spring week. It is wonderful your father was able to visit often from the UK and celebrate a special birthday with you before he passed away. Our parents are always with us in our hearts. 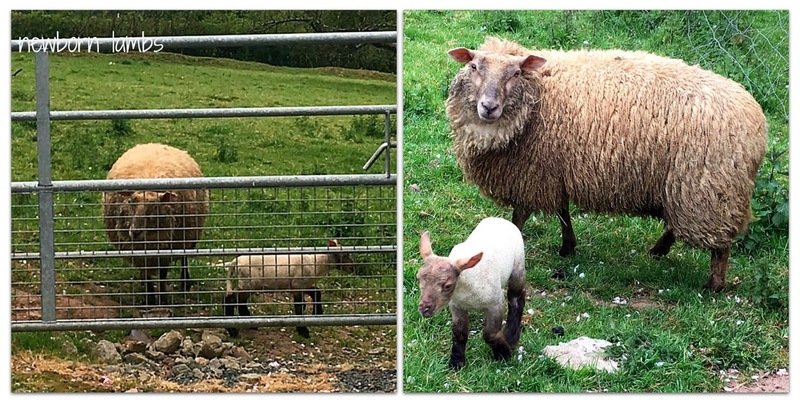 I remember seeing lambs born on a visit to Ireland. They are so delightful--like children at play! I have been blogging almost 10 years... it has been a wonderful experience and I've met so many nice people like you from around the world. I am sure your Dad is proud of you to be documenting your life in Normandy through your blog. I send you hugs at this anniversary. I miss my Dad who passed away a couple of years ago. I am sure you do too. Congratulations to 9 years of blogging. It is lovely to read your pists about life in Normandie. We are just back from a ten day journey to Normandie, Guernsy and Jersey. We really loved Normandie, spent most of the time at the Cotentin peninsula, and inland through Falaise, Calvados and Camembert. Fantastic castles and Norman history. Lovely memories to cherish. Normandy looks like a wonderful spot to live. Do you ever return home to visit? Loved learning some of your "back story' Maggie....it's easy to see why you two love your life in Normandy. I'm sure your Dad was right ... you could write a book! Dear Maggie ... lovely memories of your Father and twenty-one years in Normandy! I love seeing Normandy through your eyes -- armchair traveling at its best for me. I can see why you love it so much. Cows -- I love cows -- I think it's their beautiful brown eyes! Happy Monday and thanks for hosting! Happy 9th anniversary to you and your blog Maggie. Glad you have good memories of your dear father. How nice that you were inspired to start the story about your life in Normandy from your father. Twenty one years is a good stretch of time to be settled in a beautiful area. Thank you for hosting Mosaic Monday. Happy Blog Anniversary, Maggie! I am so delighted you discovered blogging, and that somehow -- in this wonderful world of Blog -- I discovered you. I loved the memories of your dad. Twenty one years is a long time to be living in a country not your own -- but I think now in a great many ways, it IS your own. Your own Normandy. And I loved every single photo! Happy 10th blogging anniversary Maggie dear. Always love your posts and stopping here to see what's happening at your home, the village, and beautiful Normandy. Like you, I always enjoyed my family members' visits to see me here in the US - and of course I went home a lot too. Now nobody comes, those who are left are aging, they seem to feel more comfortable at home with travel being harder and often upsetting. I'm not even certain I will be visiting the UK again - other than the airports! I want to of course, but with a few other countries I hope to see, and what is now such a big expense to rent a place at home in England for a lengthy stay, it may not be in the cards. Today I posted a story about how I came to America - wow, just writing about it brings back so many memories! Hope spring continues to be beautiful around your home. The SP certainly seems to be enjoying getting out at the vide grenier - and that's the biggest hot dog I've ever seen, haha! Happy Anniversary to your 9th year of blooging, Maggie! And so lovely, warm and touching words, memories about your father. A very lovely tribute. Great aspects captured in this Spring, as well. Many thanks for sharing them with all of us! Best regards and a very wonderful new week, to you! 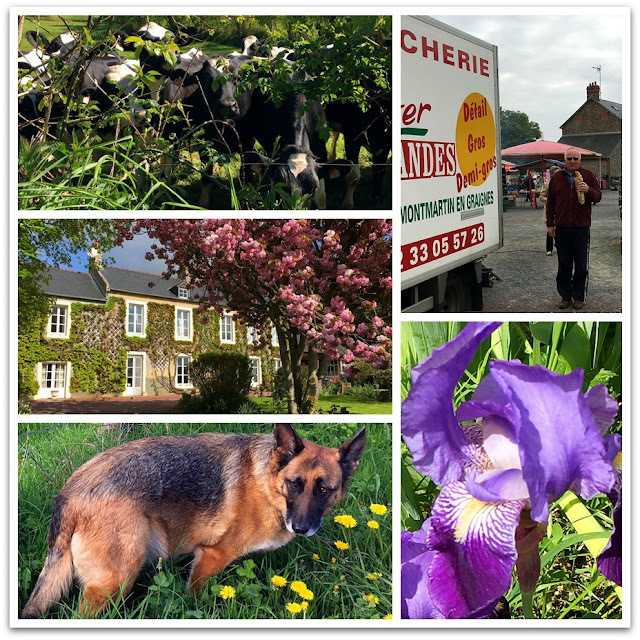 Maggie, congratulations on your Normandy Life's blog anniversary! Nine years is quite an accomplishment! I love the photos of your neighborhood and your dear German Shepherd, my favorite. The sheep and cows and flowers are all so beautiful. Thank you for hosting Mosaic Monday. Have a lovely week. Congrats! I love the sheep and the dog!